The first request for funds for this light were sent forward in the budget recommendations in 1868. This request was inserted in budget requests to Congress for the next 13 years until finally, in 1881, the request was approved. Because of the exposed location in only 8 feet of water and the danger of ice flows, a iron caisson was chosen for placement. The caisson was to be 30 feet in diameter and 30 feet high with a tower on top that would be 37 feet tall with a total height above the water of 54 feet. Construction started in June of 1882 and proceeded with no major problems. The light was first lit on October 1, 1882. Almost at once, the action of the tides caused the caisson to start leaning. At one point it was about 5 degrees out of level. Work was done in 1883 to try to stabilize the tower by dredging and dumping rock round it. 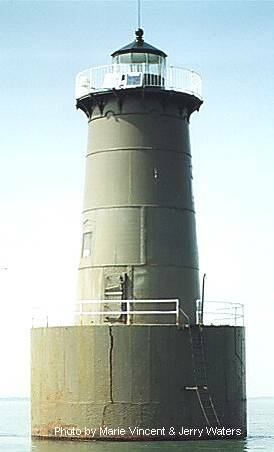 In 1885 760 tons of stone was placed around the tower to further defray the scouring of the bottom from around the light. This work brought the light to within 2 degrees of vertical and has stayed that way up to this day. In 1960, while the light was manned by two young Coast Guard men, a fire started in the equipment room and spread through out the lighthouse even though they did their best to extinguish the blaze. They were barely able to get off the light before the fire reached the 500 gallon gas tank and the whole light exploded. The Coast Guard and others fought the fire for over 6 hours before it was put out. The whole interior was consumed by the intense heat of the fire. The interior was never rebuilt. The interior was cleaned out and the light was automated. This is another light that you really can't drive to. It appears that you can get close enough on shore to at least get a view and maybe a picture if you have a good lens for your camera; it is only 0.9 miles off shore. Going east on US Route 50 from Annapolis, cross the Chesapeake Bay Bridge and exit at Maryland State Route 8, exit 37, the first exit after the bridge, and go south onto Kent Point Road. Continue on Kent Point Road for 7.1 miles until State Route 8 bears off to the left onto Romancoke Road but you need to bear right on Kent Point Road. 1. Over a mile on Kent Fort Road take a right on Light House Road and follow the road until it ends. Make a left on Lighthouse View Road and Bloody Point Bar Light can be seen in between the houses. This is the least favorable view. 2. Go about 1.5 miles on Kent Fort Road and take a right on Bright Road. At the end of the road there is a small private residential beach that has a boardwalk that goes from the road to the beach. Here you have a great view of the Light. 3. Go 1.7 miles to the end of Kent Fort Road and take a right onto Willard Road. Right after the private dock and bait shop you can see the Bloody Point Bar Light on your left. Driving directions courtesy of Yanchulis family.